Well I didn't manage to get back on the bank this week but it was a fantastic season that saw me catch 12 carp to 20lb 2oz, a new personal best, 37 pike in 5 sessions with the largest being 25lb 4oz, a new pb, plus a second twenty at 23lb 8oz and a new pb perch at 2lb 1oz. So three personal bests in one season! Three PB's in one season is an amazing result. Well done!! 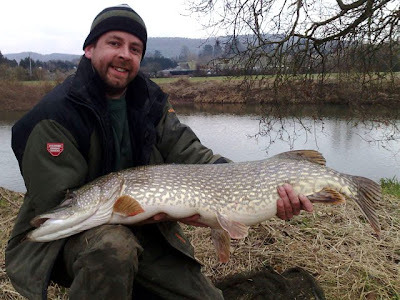 I have watched many TV fishing programmes about the Wye including one on Pike fishing, what an awesome river to fish. What a season mate. Well done. Mothers day got in the way of my fishing this weekend, so my mission to pull a twenty out of the nene will have to wait. The grand union awaits me now, a bit of an unknown. Nice and quiet though!